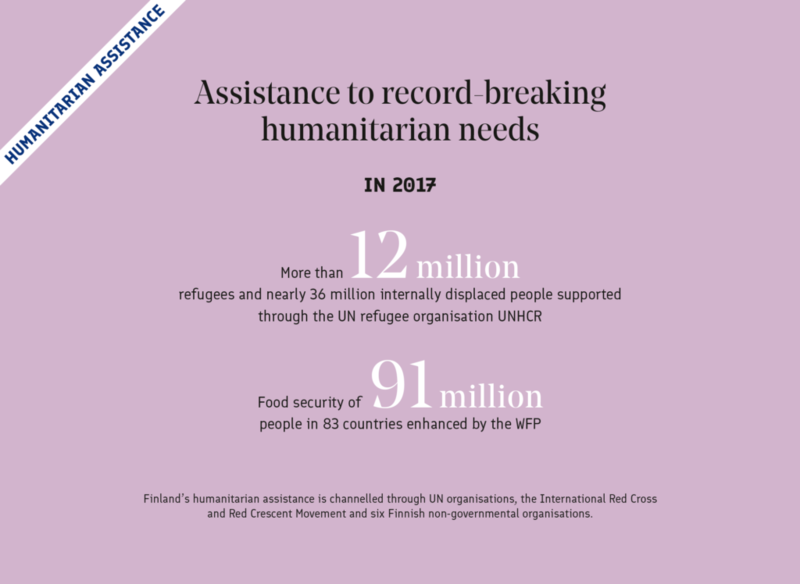 In 2015–2017 the global humanitarian needs reached record levels. At the end of 2017, a total of 136 million people in 25 countries were in need of urgent humanitarian assistance. water and sanitation, as well as food assistance. Finland is a pioneer in promoting the rights of the persons with disabilities in humanitarian situations. A large proportion of the Finnish assistance is flexible, granted as core funding or loosely earmarked regional or country level assistance. Aid is channeled also through Finnish civil society organisations. through food assistance, support to emergency nutrition programmes for pregnant and lactating women and small children, and investments in water infrastructure and sanitation, as well as in health and hospital services crucial in conflicts and emergencies. through the World Food Programme (WFP). In 2017, WFP improved the food security of 91 million people in 83 countries. In addition, cash and vouchers were also distributed. About 36 million people were provided with access to clean water, improved sanitation and better latrines as a result of the work by the International Committee of the Red Cross (ICRC), Finn Church Aid, Word Vision Finland, Plan International Finland, and Save the Children Finland. In the health sector, the focus was on the health and hospital services needed in armed conflicts and natural disasters. ICRC performed a total of 136,000 surgical operations during 2017. The Finnish Red Cross contributed to the work by sending 11 aid workers with health training, pharmaceuticals and medical supplies worth EUR 256,000 and a field communications unit to the Mosul operation of the ICRC. The Finnish Red Cross also acted as the personnel and logistics coordinator of the other participating Red Cross organisations and as the main partner of the ICRC. million was distributed to more than eight million people. The organisation helped about 500,000 refugees to return safely to their homes. In 2017, Finland was the 24th largest donor of UNHCR. Finland’s contribution totalled EUR 20 million of which seven million was un-earmarked core funding. Finn Church Aid provided nearly 39,000 people with emergency shelters and accommodation. Victims of sexual and genderbased violence were provided with support and pre-emptive assistance through UNFPA. For example, in Syria more than 10,000 people received such aid. Finland focused efforts also on child protection. Finn Church Aid provided 61,000 children with psychosocial support. Save the Children Finland channelled aid to nearly 18,000 children and families in Iraq and Somalia. Plan International Finland reached more than 5,000 children and parents. agricultural tools, seeds and other assistance helped economies to recover by boosting food production and providing better opportunities for earnings. Through the UN agency UNRWA, Finland helped more than 500,000 Palestinian refugee children to receive education. Nearly 8,000 young people received vocational education and 39,000 other people were granted microloans. As a result of the work by Finn Church Aid, more than 55,000 children and young people received education. The organisation also built classrooms. Work of Plan International Finland enabled early childhood education for more than 3,500 children. Fida International channelled its support to the education of children in 11 schools and two children’s activity centres in the Democratic Republic of the Congo. population has fled the hostilities either with their own country or abroad. Over the past few years, Syria has been the largest recipient of Finland’s humanitarian assistance. In 2017, about 637,000 children received psychosocial support and more than one million children were able to go to school in Syria. UNICEF repaired a total of 105 schools with Finnish funding. unique in the history of humanitarian assistance. In 2015, Nepal was struck by two powerful earthquakes. Nearly 9,000 people were killed, 600,000 homes were destroyed and 2.8 million people were left homeless. The Finnish Red Cross sent more than 30 delegates to the areas hit by the earthquake to carry out assessment, logistics and communications tasks. The assistance also included an x-ray screening unit for a field hospital and aid supplies for medical purposes. Social workers and voluntary child protection committees have been trained in Iraq and Somalia with the assistance provided by Save the Children Finland. As a result, nearly 7,000 girls and more than 5,000 boys have received help after suffering violence, being abandoned by their families or becoming separated from their parents. Reconstruction Trust Fund, which is administered by the World Bank. The project has been active since late 2016. One of its purposes is to ensure that basic services and work are available to people returning to Afghanistan. When job vacancies are filled special consideration is given to families in a particularly vulnerable situation. The programme has alreadyreached more than 2,400 communities. 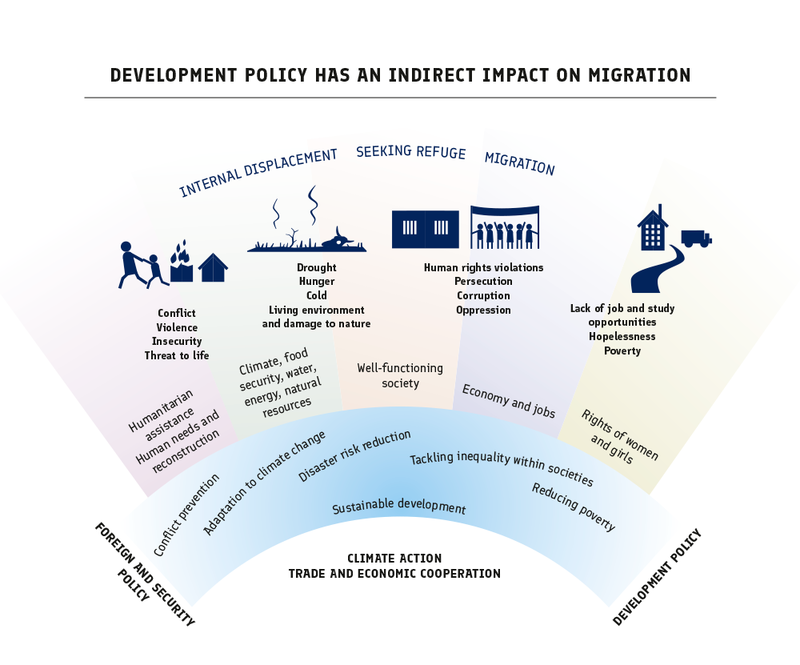 About 42,000 households of returning refugees have benefited from the programme. Finland’s planned contribution in funding the Citizen Charter is approximately three per cent.